Food doesn’t just nourish our bodies — it sustains our souls. And in the case of several social justice-focused organizations located in the Pacific Northwest, breaking bread with others is central to broader understanding, tolerance and progress in our society. Eat With Muslims, The Restaurant Opportunities Center of Seattle and FEEST Seattle are all recipients of grants from the Seattle Foundation, which recently awarded $327,000 this past spring through its Resilience Fund to advance the human rights of vulnerable community members. Here’s a taste of how each group finds empowerment through its core mission — and what donors can learn about making an impact on equity, one meal at a time. 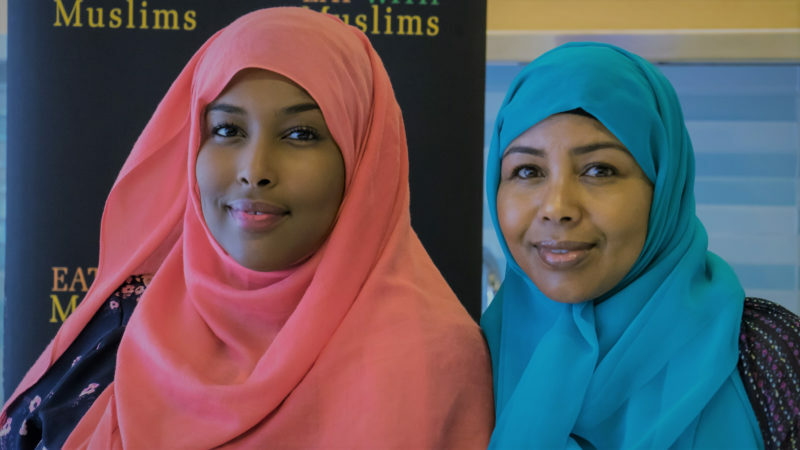 Somali-Americans Ilays Aden and Fathia Absie started this grassroots project not long after the 2016 election, out of concern that intolerance and hate speech were on the rise, targeted especially toward Muslims and immigrants of color. The idea was simple: Connect people of different faiths and backgrounds through a shared, home-cooked meal. “It was a way to take charge of our own narrative,” says Absie, who notes that after hosting events in the Seattle area (mostly in churches, community centers and private homes), the initiative has started to expand to other parts of the country. In Iowa, one dinner brought together about 25 people, half Muslims (Somalis and Syrians) and half Christians. The guests decided to continue their relationship and get together monthly. Some of the Christians wanted to learn Arabic and, in return, teach the Syrians — who are newer refugees — English. Aden and Absie are now working on a web series about the overall experience, along with a short film and an event with featured speakers. If you are looking for more articles and resources for Race and Ethnicity, take a look at these Giving Compass selections related to impact giving and Race and Ethnicity. Giving Compass' Take: • Writing for Northern California Grantmakers, Elena Chávez Quezada of the Chavez Family Foundation lists ways in which funders can address the needs of their grantees in more responsible, empathetic and productive ways. • How much of Quezada's advice has your own organization internalized? And are we doing enough to support nonprofits led by people of color? • Here are some more tips for grantmakers when it comes to evaluating charities. I was born in New Mexico and grew up in a large, hard-working family. My visionary Mexican-American parents pushed us to pursue a college education and to never settle for anything less than our very best. Their guidance led me to a career that I love and kept me part of a rich culture and community that I support. When the Latino Community Foundation invited me to join a conversation with the members of its first Latino Nonprofit Accelerator cohort, I was excited — this was an opportunity to hear directly from Latino nonprofit leaders. The discussion session was billed as a “Candid Session with Funders,” and I came prepared to offer fundraising advice. Having been on the grantseeker side for much of my career, I thought I understood the challenges that grantees face today. I expected a tough but productive conversation. But the discussion floored me. Latino nonprofit leaders were frustrated, and rightly so. Not only do Latino-centric nonprofits currently get a meager 1.1% of total American philanthropic dollars, but their communities are under attack by the current administration. It’s rare to get the real story when you’re a funder. Nonprofit leaders who are struggling to keep their organizations viable don’t often risk their funding by telling program officers how philanthropy is letting them down. But at this Latino Community Foundation session, nonprofit leaders were able to share their truth — truth I needed to hear. This is a chapter of a national organization that seeks to improve conditions in the industry for low-wage workers, and organize employees, diners and restaurateurs to create a more ethical restaurant environment. In that regard, the grant from the Resilience Fund will go to ROC’s Sanctuary Restaurants project — enacting a “zero tolerance” policy for racism, sexism and homophobia. This means training restaurant workers and owners about sexual harassment, along with education on immigrant and LGBTQ workers’ rights. So far, 500 establishments have signed onto the program nationally, getting a visible stamp that shows they are part of this movement. Elena Perez, spokesperson for ROC Seattle, says that the grant money will help them will expand outreach to primarily Spanish-speaking workers and increase their capacity to engage other non-English speaking communities. Many of these immigrant workers are being targeted by wage theft or other forms of workplace abuses, and have few resources when seeking to have their rights respected. Simultaneously, the goal will be more large-scale change. “Let’s examine the systems that are in place that create unsafe spaces,” says Perez. If restaurants aren’t paying a fair wage, with the majority of tipped workers being women, and if low-wage back of house positions are primarily held by people of color, how does that create power imbalances? Many non-English speaking immigrants find employment in the restaurant industry but that makes this industry a target for ICE activity. “Let’s examine the systems that are in place that create unsafe spaces,” says Perez. Philanthropy lesson to digest: Align words with actions. As a diner, you can encourage more restaurants and cafes to get that Sanctuary designation. As an influencer, you can work toward more humane immigration policies and support groups that give free legal representation to low-wage people in this industry (one local resource Perez recommends is the Washington Immigrant Solidarity Network). As a human being, you can stand up for the rights of those who serve you and the ones you serve. Want to empower youth? Start by feeding them right. That’s the general principle behind this group that delivers out-of-school programs to low income youth and youth of color in South Seattle and South King County. What started out as a basic, improvised meal prep for a community dinner, using fresh, locally-sourced ingredients that engage young people to experiment with different tastes, expanded into a robust organization that pushes against food injustices. “We want young people to pull in knowledge from their families or their own life experience to inform the meals,” says FEEST representative Becca Meredith. Weekly dinners are part of the core programming. But the key to FEEST is that young people are leading the way from start to finish. There is an internship program, in which members organize events and lead advocacy work, such as making sure that school lunches aren’t loaded with junk food. In fact, FEEST has had three recipes from their program go districtwide, meaning the youth are dictating what’s being fed to them (grant money from the Resilience Fund is going to such “school foods” work). “We want to create a space for them to examine what is healthy and how do we redefine that for ourselves,” says Meredith. It’s more than nutrition — it’s eating around a table with your family or friends or community. That’s part of your emotional health. Learning with others and benchmarking are key steps towards becoming an impact giver. If you are interested in giving with impact for Human Rights, take a look at these events, galas, conferences and volunteering opportunities to connect with individuals like you. If you are looking for opportunities to take action and give money to Human Rights, here are some Giving Funds, Charitable Organizations and Projects aggregated by Giving Compass where you can take immediate action.